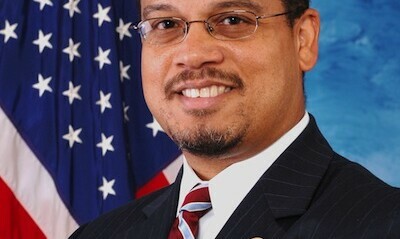 WASHINGTON (AA): The first Muslim to potentially head a major American political party will have to wait to find out if he will lead Democrats after the group said Tuesday internal elections were moved to Nov. 30. House Majority leader Nancy Pelosi agreed to postpone the elections after Democrats said they needed more time to evaluate the party’s crushing defeat in the general elections. Last week’s election saw the party lose control of the White House and fail to wrest the Senate from the Republican majority. House lawmaker Keith Ellison announced his bid to chair the Democratic National Committee (DNC) and is widely regarded as the front-runner to win the post. The five-term House member is a staunch progressive, and has been backed by former Democratic presidential candidate Bernie Sanders to lead the party. The Democratic National Committee is the formal governing body for the United States Democratic Party. The committee coordinates strategy to support Democratic Party candidates throughout the country for local, state, and national office. “It is time for the Democratic Party to make it clear that we will become a grassroots party which stands with the working families of this country and will fight for a government that works for all of us, not just the 1 percent,” Sanders said in a message of support. Ellison also has the backing of the party establishment, including Sen. Chuck Schumer, and outgoing Senate minority leader Harry Reid. Ellison is the first Muslim-American to be elected to the House of Representatives, and co-chairs the Congressional Progressive Caucus. He also serves on the Financial Services Committee. The top spot in the DNC has been vacant since former chair Debbie Wasserman Schultz resigned after leaked emails appeared to show her conspiring to undermine Sanders in his bid to defeat Hillary Clinton in the primary elections.